For more than two decades, Dr. Cecil C. Bozarth III embodied NC State’s Think and Do spirit. Bozarth filled rooms – both literally and figuratively – in Poole College of Management, helping the new college transform into a driving force that equips students to solve real-world issues in today’s data-driven, global economy. As a professor of supply chain management, he believed in the mission of NC State, and his unique, colorful style and friendly demeanor advanced Poole College’s mission of enhancing the success of students through educational innovation. When Bozarth passed away suddenly in May at the age of 55, he left a void in Nelson Hall. Bozarth is gone, but his legacy will live on in the college. Within weeks of his death, his closest co-workers in Poole College came together to create the Cecil C. Bozarth III Scholarship Endowment. The scholarship started out as an idea, a possibility, a way for Bozarth’s colleagues to memorialize him. But it quickly became proof that Bozarth’s impact on the college had been enormous. “This was going to create a lasting memory. The idea of a scholarship aligns with what Cecil was passionate about. It’s about helping students go to school, and that’s what he cared most about,” Warr said. Faculty members and other donors quickly contributed more than $60,000 to the endowment, which will provide need-based scholarships for students in the college who are pursuing a concentration in operations or supply chain management. Andrea Irby, Bozarth’s wife of eight years, said she has been blown away by the response from Cecil’s colleagues. Their gifts more than double the organizers’ original goal. “It was inspiring to see people respond and give. These were people who had connected with Cecil. They were proof of his impact,” he said. Bozarth’s Think and Do spirit extended well beyond Nelson Hall. 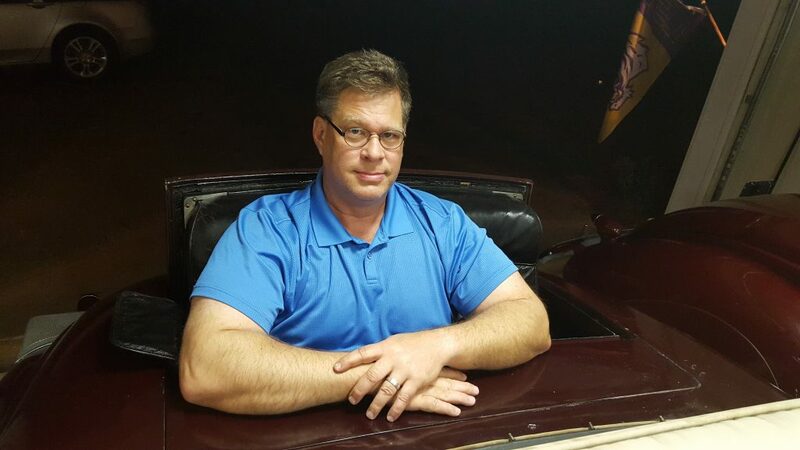 He was a father, husband, son and brother, and he had a passion for cars. Specifically, vintage cars. He restored a 1966 Ford Mustang using original parts, and later, he reconstructed a 1937 Lincoln Zephyr Coupe. Cecil Bozarth poses with his fully restored 1937 Lincoln Zephyr. Irby recalls the days when rare car parts would arrive at their home. She also remembers seeing Bozarth show off his work at car shows. He won awards and made friends, Irby said, always beaming about his Lincoln and ready to trade stories with other car enthusiasts. “He loved the quality. He loved the history, and he loved showing cars,” she said. Bozarth’s connections ran deep at Poole College, and they were perhaps most evident in the classroom, where his larger-than-life personality and passion for problem-solving helped thousands of students. “There is a little bit of performing arts in this business. The best professors have to be able to draw students in, and Cecil did that. He connected with people. And it wasn’t just that he was entertaining,” Warsing said. Warr said Bozarth had plenty of chances during his 26-year academic career to move up and take on leadership positions within the college. But it would have taken him away from teaching, the realm where he felt he could make the biggest difference. In 1999, Bozarth and fellow professor Dr. Robert Handfield created the Supply Chain Resource Cooperative, built on the idea that Poole College’s curriculum would leverage partnerships to ensure students could understand the “real world” of supply chains. Irby got to know that side of Bozarth inside and outside Nelson Hall. After coming to NC State in 1993 to serve as the first director of advising in Poole College, Irby said she quickly learned that Bozarth’s “larger than life” personality allowed him to help students. Bozarth’s legacy of helping others and making connections that matter will live on through the memorial scholarship. The first Cecil C. Bozarth III Scholarship was awarded this fall.